Like a charming and steadfast fellow who comes to every function and politely asks you to dance, Woody Allen continues to churn out reliably entertaining fluff that it would be easy to take for granted. His new one, Magic in the Moonlight, has a subtext that takes on such cynical indifference, however; the notion that to dislike this darling confection would be to resign oneself to a self-imposed gloominess is built right in. Here Allen returns to the topic of magicians and their activities, one of his old showbiz fascinations (last seen, if I remember correctly, in Scoop). Colin Firth stars as Stanley, an illusionist in the late 1920s who dresses up as a Fu Manchu-style performer to wow audiences with the mysteries of the Orient. (Don't worry, despite the get-up, there's no yellow-face caricaturing or bad accents going on.) Backstage after a performance in Berlin, Stanley is met by fellow magician Howard (Simon McBurney, Harry Potter & the Deathly Hallows). Howard is concerned about a wealthy family he knows who have been taken in by an American mentalist who alleges she can speak to the dead. Stanley is an expert at debunking such prevaricators, and so he agrees to visit their estate in the French countryside and expose this young lady as a fraud. 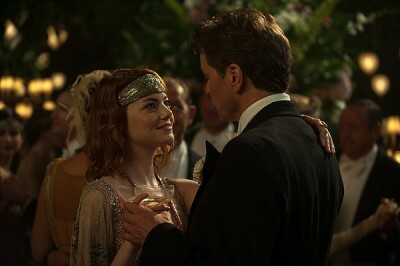 The medium in question is Sophie (Emma Stone), who proves more cagey and more beguiling than Stanley bargained for. The magic man and mystical woman become friends, there are romantic sparks, and when all of his attempts to trip her up fail, Stanley starts to believe that maybe Sophie is the real deal. Which is where the aforementioned happiness factors in. As a lifelong skeptic, Stanley believes there is no magic in real life. A cheery outlook is merely a delusion. He can't even see the point in bird watching. Why spend time observing animals indulging in their base nature? Eating and surviving is what we all do. Sophie changes all that, however, because once Stanley accepts that her abilities are real and there is another world beyond that which is readily known, he can surrender to it and himself be free. The more he struggles against it, the more it ensnares him. Again, is there a more apt metaphor for much of Woody Allen's later-life output? Scoop, To Rome With Love, Midnight in Paris--you kind of have to work at it if you want to not enjoy them. (Fold your arms tighter, hold your breath, you can do it!) I recently read a piece of criticism that described a particular work of entertainment as not being a "game changer" for the artist, but worth examining nonetheless, to which I could only wonder, what is the point of such a critique. How many games are there really and how much can they legitimately be changed? And why must they be when the state of play is fine as is? It seems that here lies disaster. With so many blockbusters and franchises always having to up the ante, the only analogous game for modern moviemaking is Jenga, and these towers must fall! It makes sense to celebrate the predictably enjoyable rather than denigrating it. Woody Allen understands what he wants out of a trifle like Magic in the Moonlight, and he understands how to put it together. His casting is excellent--Firth and Stone make for a wonderful onscreen duo, and I daresay it's the first time I've really been surprised by this lead actor since maybe A Single Man--and everything Darius Khondji photographs looks marvelous. Even the old-style jazz tunes are dependably delightful. So, what's to lose here? 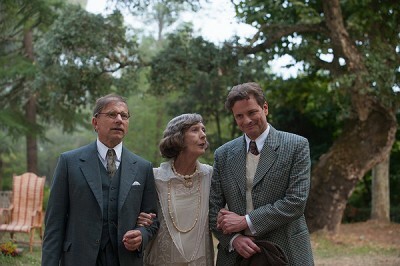 Don't take the appearance of Magic in the Moonlight in our cinemas for granted. Woody Allen is 79 years old, for goodness sake. He doesn't have to keep doing this, he could easily take his camera and go home. Appreciate the old guy while he's still around. Order "Magic in the Moonlight" now!